I was talking to a friend about one of my favorite magazines and she had not heard of it. I thought I would mention it to all of you incase you hadn't heard of it either. 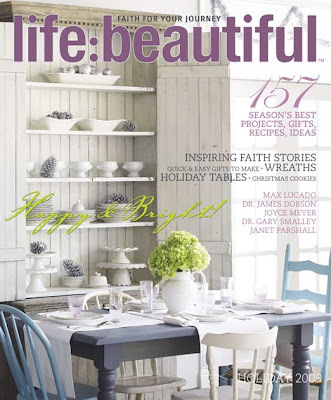 Life:beautiful is relatively new on the market and is published quarterly. Everything is infused with scripture. 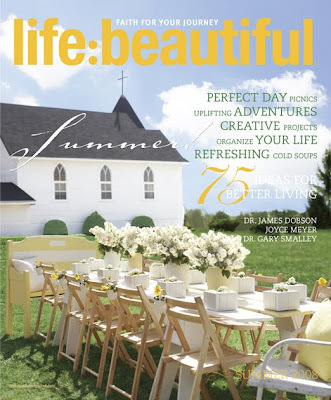 It brings God's Word into all those things we love to look at in a magazine and for me it's the best part. 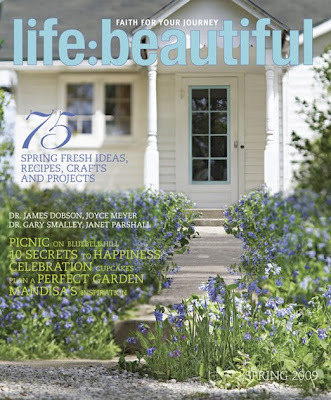 The spring 2010 issue just arrived in my mailbox. It has an adorable bunny topiary on the cover in a lush shade of spring green. Make a visit to Barnes and Noble today, you won't be disappointed. Have a fun Saturday! Wow I have never heard of this magazine either. Must take a look. I am still on the hunt for Flea Market Style. Looks and sounds like a wonderful magazine, Renee. It makes me a little sad to find a great magazine and it to only come out quarterly! I'll look for it out there. Thanks for the info. I subscribe & LOVE that magazine! I highly recommend it, too!! I've never seen it before either. Thanks for sharing it becuase it looks wonderful! I went to our B&N, but they didn't have it, so. . . I just put in a subscription order! This sounds like a magazine that is just what I'm looking for. I do like many of the magazines out there - but even when they're pretty - I sometimes feel like even with all their 'stuff' - they are empty somehow. I know that the addition of scripture & a meaningful world-view - this will be a wonderful treat - every 3 months! Thanks so much for posting about it! I too, have never seen this magazine. I will be looking for it. It sounds just like one I would love. Thanks for sharing about it. Hope you are having a great weekend. I am new to your blog...and have enjoyed my visits. 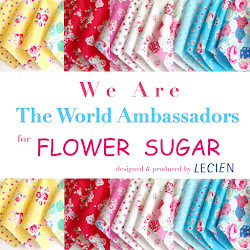 I wanted to thank you for telling about the magazine. I have never heard of it, but love good magazines and this one looks like one I will subscribe to.